You might think it goes without saying that the kayak is used only by men. But that is not always the case. In years past, at a time when there were not enough men in the villages of southeast Greenland, a number of women there took on the role of kayak hunters. About the early 1930s, when Rockwell Kent stayed in Illorsuit, he speaks of a woman called Karen (not the same woman I knew) who “could handle a kayak like a man. She’d killed her seal. Few Greenland woman could match that.” (Salamina, page 141). Keld Hansen tells of “two elderly women, Dorte Pjetturson at the settlement of Illulik and Signe Petersen from the settlement of Qaarusulik, had both shot bears and caught a number of seals from kayaks in open water and from the ice” (2008, page 225). When I was in Illorsuit in 1959, however, all the kayak hunters were men. I’ve described the equipment that was made for my kayak, all of it entirely typical of what the Illorsuit hunters were using at that time. However, it’s good to remember that the seal hunting I observed and know about was all happening late in the open water season. My stay in Illorsuit was from August 22 to October 18. So the hunting and the use of hunting equipment that I know about were not necessarily typical of the summer as a whole. Because of the use of firearms, certain hunting tools that had for generations been essential to survival were no longer needed. The traditional bird darts, bladder darts, and the killing lance (with its associated wound plugs), none of these were any longer in use. As Hansen (2008) tells it: “the rifle has replaced the kayak lance. The cal. 22 rifle and the shotgun have replaced the bird dart and the bladder dart” (page 10). On the other hand the use of firearms had led to certain innovations. The gun bag (obviously), the skeg, and the shooting screen were all “invented” as a result of the use of firearms. The killing lance, back when it was still in use, was carried on the left side of the after deck. In its place Tobias had the spar of wood you can see in the several photos of his kayak in Chapter Eight, The Hunting Trip to Umiamako . I was told that this made it easier to carry a small seal on the deck. From my photos I can see that at least seven of the Illorsuit hunters had some equivalent on their kayaks. In one or two cases these were winter ice chisels. At Umiamako, at least three of the Nuugaatsiaq hunters had spars of wood on their after decks, in one case what looks like it might be an ice chisel. This drawing of Petersen’s happens to show almost exactly the design of the 1959 Uummannaq Bay paddles. Figure 42 on page 75 of Petersen (2001). 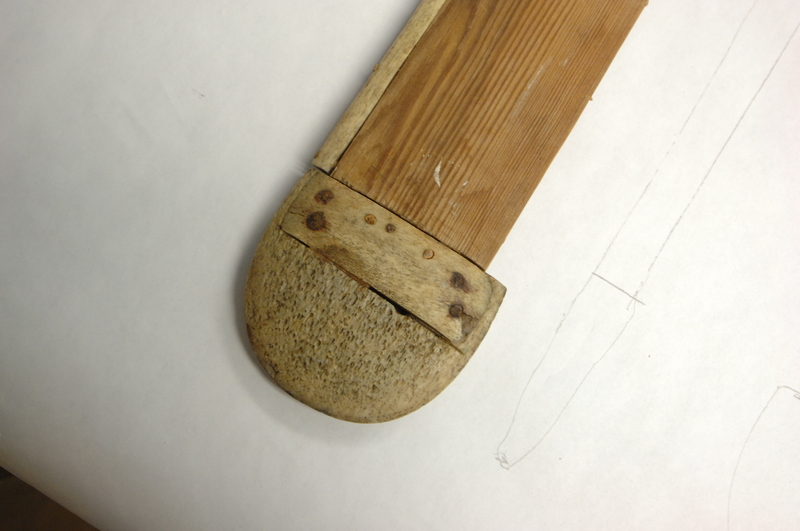 The paddles were all of this design, with a fair sized loom and distinct shoulders where this met the blades. These were reinforced with bone or ivory strips along their edges and with a substantial bone piece at each end. The end pieces did not extend beyond the edges of the paddle blades as in some other districts and historical periods. They were as wide as the wooden blade of the paddle plus the minor extra width of the bone/ivory edging, giving a smooth outer end shape to each blade. You can see this, of course, in some of the photos. The paddles for John Heath’s and for my kayak (both made by Johan Zeeb, by the way, not by Emanuele who made the kayaks themselves) have this design. 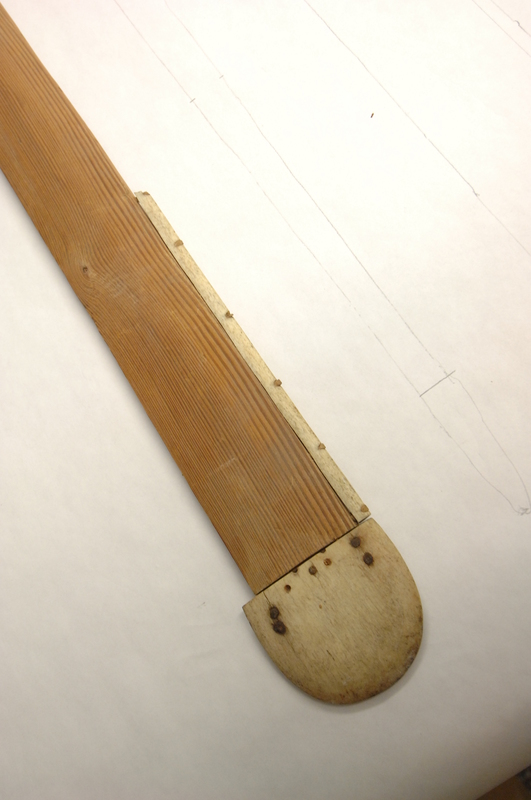 It’s interesting, I think, that Drever’s and Rockwell Kent’s kayaks also made in Illorsuit, both in the 1930s, had/have this same design of paddle; and so does the paddle associated with the Goodnow kayak of 1896! Incidentally, Petersen mentions that in “Uummannaq Fiord the kayak paddles are longer. … it is not uncommon to find paddles over 2 meters long” (1986, page 66). He also mentions drip rings made of rope being used in Uummannaq Bay but I didn’t see any when I was there. 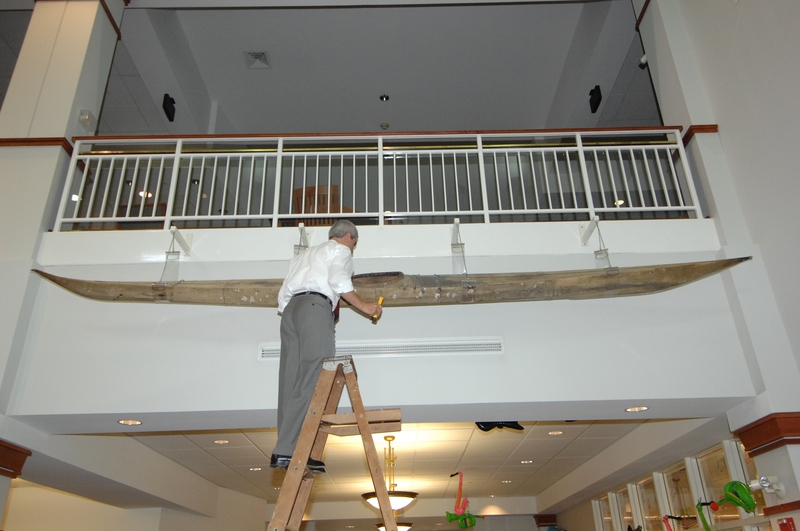 The much older kayak now in the Goodnow Library in Sudbury, Massachussets, has a fascinating story. In 1896 a group of scientists from the Massachussets Institute of Technology, Boston, one of them a Dr. George Barton, accompanied Robert Peary on one of his return expeditions (his sixth) to Greenland. Peary’s plan was to bring back to the US the largest of a group of meteorites located near Cape York in north Greenland. It weighed 31 metric tonnes and is now on display at the Museum of Natural History in New York City. As was the plan for their work, the MIT researchers were left off at Uummannaq town to carry out studies of glaciers and inland ice in the southeastern corner of Uummannaq Bay. The team travelled by umiaq and a local hunter called Ludwig Sigurdson was hired as a hunter, guide and “pathfinder” (through the icebergs, brash ice, etc.). At the end of the summer, Barton bought Sigurdson’s kayak and brought it back to the States where he donated it to the Sudbury town library. 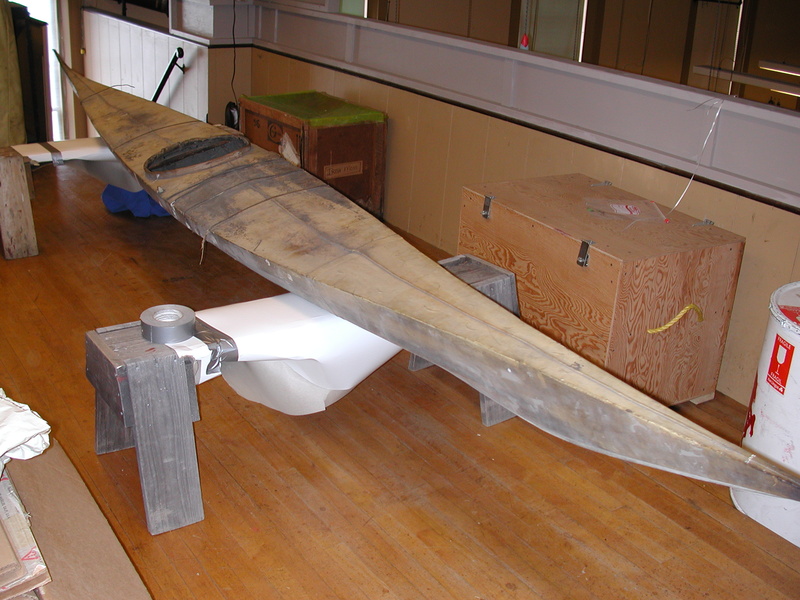 In 2001 Kane Borden and Mark Starr surveyed it and Starr includes his measured drawings of the kayak as one of five shown in an appendix to his book “Building a Greenland Kayak” (2002). As you can see in these two photos from 2007 and 2001, it’s a beautiful specimen and extremely well preserved and well looked after. “I love this kayak. It’s petite, light, and beautiful. … It’s like a partner: it does just what I want it to … [of ] several kayaks … including many replicas. … this is the kayak I almost always choose. And I love looking at it.” The paddle, by the way, [a different design as you can see] is a copy made by Harvey Golden of one from East Greenland. And here’s Ludwig, winner of the village race, with his paddle well visible. Zooming in on the Uummannaq town “Sunday hunter” entering his kayak. It’s underwater, as he’s using his paddle as an outrigger to steady his kayak while he’s squeezing into it, but I think you can make out that same design of the paddle blade. Many recreational kayaks, nowadays, are equipped with rudders. 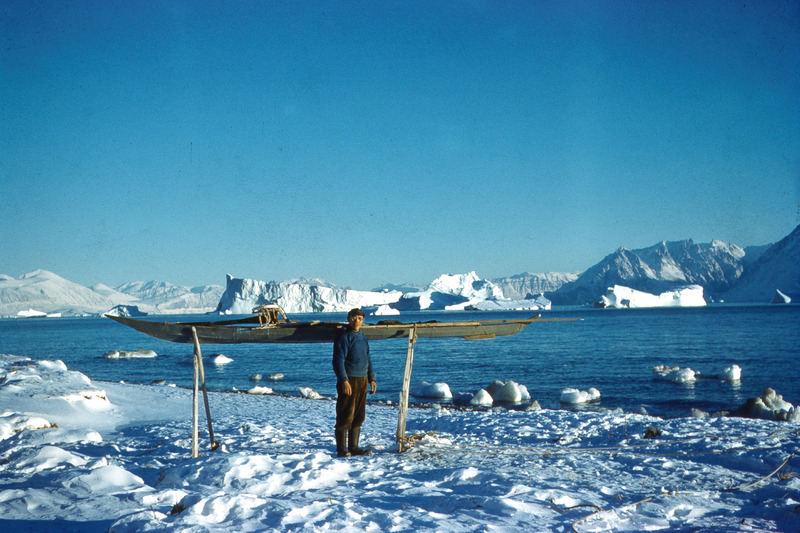 Back in the 1950s our (homemade) Scottish sea-going kayaks, like mine that I took with me to Greenland, all had rudders of one kind or another. 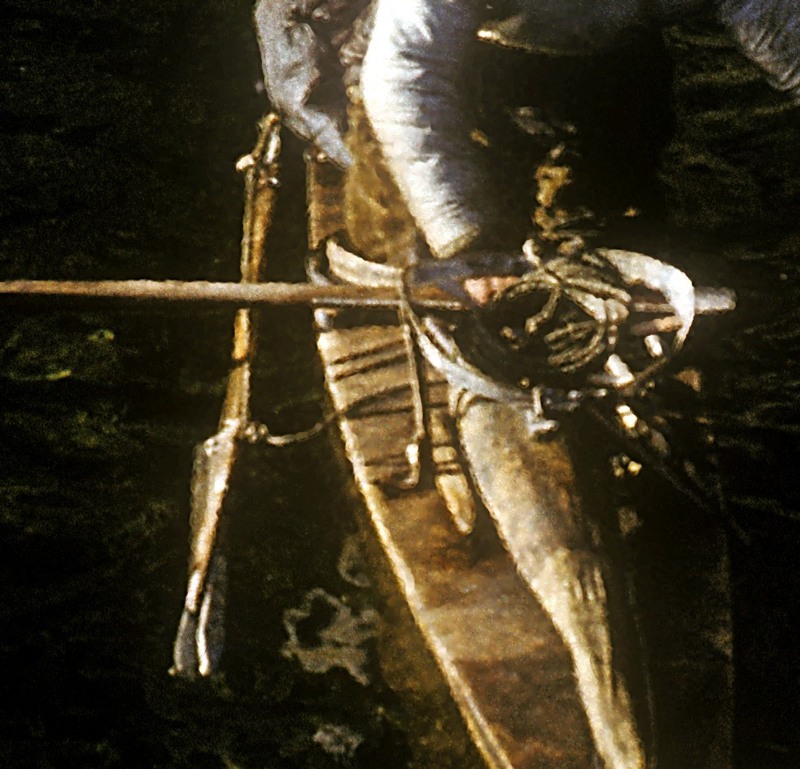 When the kayak hunting in Greenland began to include the use of firearms, it became more important than ever before to have good directional stability. Especially with the earlier kind of guns used, the recoil could be enough to capsize your kayak if you fired at much of an angle from straight ahead. Drever writes of having once made that mistake, as recently as in 1938, and of being capsized. Luckily, Johan Zeeb was there to rescue him. As he tells the story, that was when he asked to be taught how to roll a kayak! (Drever 1958 “The Kayakers of Igdlorssuit” in the Alumnus Chronicle; and 1967 “An Island in Greenland becomes linked with St. Andrews,” in Scotland’s Magazine). Knud Nielsen teaching Drever how to roll his kayak, in 1938 or 1939. 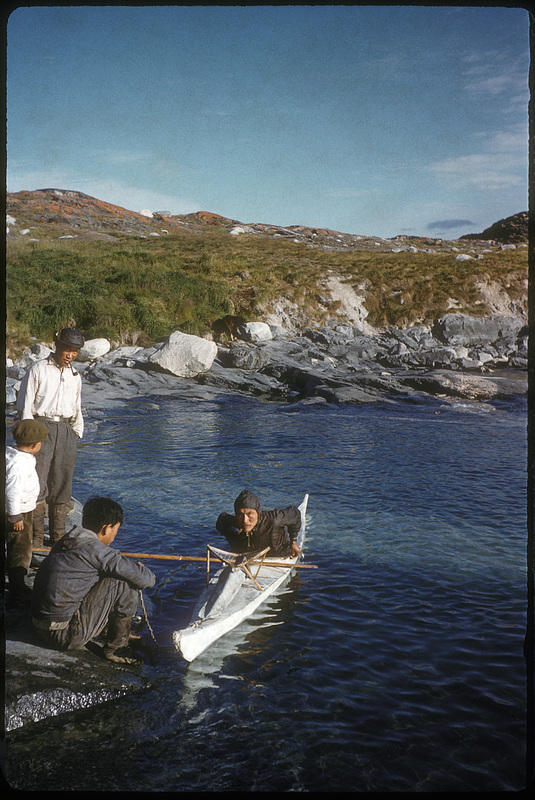 Beginning in the late 1800s the West Greenland Inuit dealt with the matter by adding a small skeg or fin to the equipment of their kayaks. This was attached to the keel line of the hull, close to the stern of the kayak. 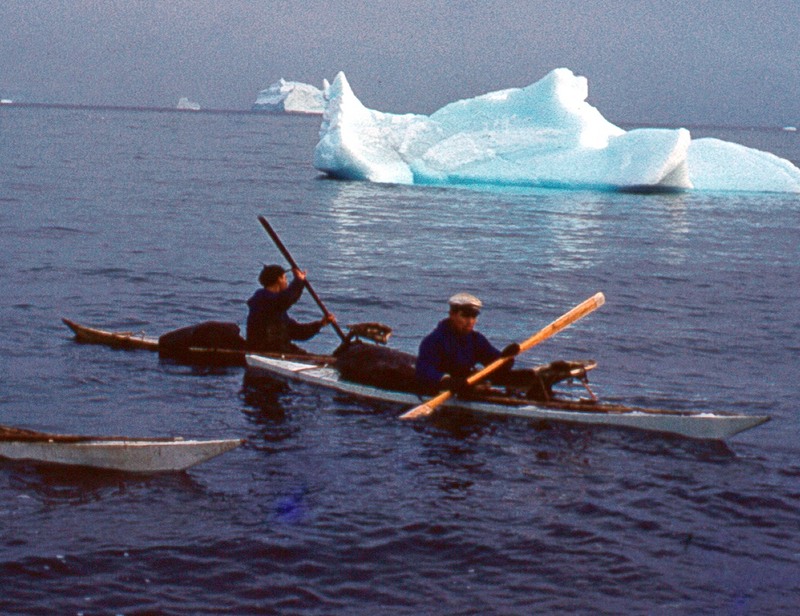 Also, of course, the pequngasoq shaping of the hulls of the kayaks in the Sisimiut and Maniitsoq regions that Petersen describes improved the directional stability of the hunters’ kayaks (1986: 48; see my Chapter Four “Building the Kayaks”). 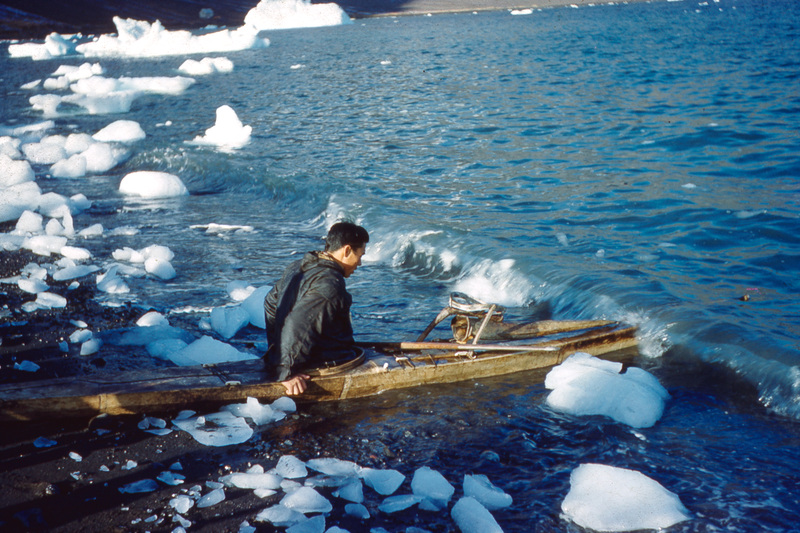 In the Uummannaq Bay district in 1959, all of the kayaks that I saw were equipped with the same kind of skeg. They were small, solid 7″ x 12″ boards always attached to the kayak by what Golden has called the “stick” method (KoG, page 90-91): a small wooden spar set across the after deck, with cords from two small holes in the skeg attached to this stick. In this photo of Tobias deflating his towing float/flotation bladder after a successful hunt at Umiamako, you can clearly see the skegs on the nearby kayaks. The earliest use of guns was in the mid-1800s but back in the days of muzzle loaders and before the gun bag came into use it was quite dangerous to use firearms as these had to be put inside the kayak between the hunter’s legs. Several hunters are said to have lost their lives in accidents with these guns. All this changed when a hunter called Nukappi of Qaarsut invented the gun bag, around 1870 (Qaarsut is the village I visited one afternoon with Palase Rasmussen and his family, see Chapter Two). Needless to say, use of the gun bag spread very quickly up and down the west coast (Petersen 1986, pages 108-109). The gun bags are always described as having a wooden support holding the open end clear of the deck to avoid having water enter the bag. Unfortunately, only one of my photos shows any sign of this support and, for some reason, one was not included in the gear made for my kayak. Enoch squeezing into his kayak before he goes out to demonstrate rolling. Between his paddle and the open end of the gun bag you can see something made of pale wood. That must be the gun bag support. Tobias inflating his flotation bladder in preparation for towing a dead seal back to camp. Here you can see the gun bag lifted clear of the deck, and the stocks of both his shot gun and rifle. You can also see how the open mouth of the gun bag is held up to the underside of the harpoon line tray by two cords. I already mentioned how, on a kayak like mine, the front end of the gun bag would be tied to the bow thong. But some of the hunters had a special piece of thong stitched onto the kayak skin for that purpose (see KoG, page 82). By examining the various photos I have of some of the kayaks, I can see eight kayaks that have this special gun bag attachment device (Tobias’, Enoch’s, Edvard’s, Hansi’s, Hendrik’s, Malaki’s, and two of the Uummannaq town kayaks on a communal rack). Only one photo shows a kayak with the gun bag tied onto the bow thong: the Uummannaq town Sunday hunter’s. Every kayak I saw was equipped with a white camouflage screen attached close to the bow. This was for the hunter to duck down behind, motionless of course, any time that a seal he was stalking turned in his direction. 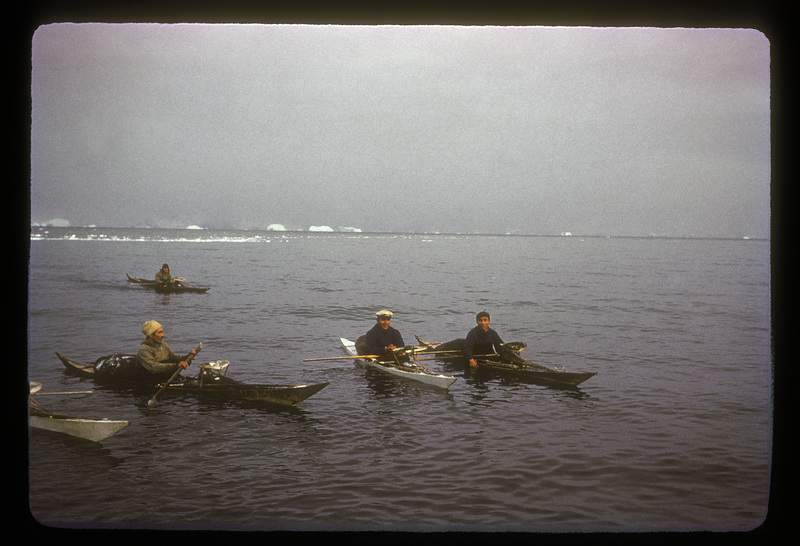 At different times and in different places there have been other ways that Greenland hunters arranged this camouflage screen on their kayaks. Right up close to the bow and of that pretty much standard size was how it was being done in Uummannaq Bay while I was there. Unfortunately I never did see a hunter put his shooting screen in place while already in the kayak. I was told that you can clip the wooden support piece onto the tip of one blade of your paddle and then pull it towards yourself until it clips securely onto the fore deck just behind the stem piece. A close up of two of the Nuugaatsiaq kayaks with shooting screens in place. Especially on the white kayak being carried to the shore, you can see clearly how close to the bows the screens were attached. Update on April 9, 2015 — I’ve been looking at Chris Hare’s reports on his 1966 visit to Illorsuit, as a kayaker member of Drever’s expedition of that year. Here is Chris’ photo of Ludwig Quist (who won the village race in 1959) in 1966. And Chris’ photo of Otto Ottosen in 1966. When I was there, Otto was spoken of as the best hunter in the village. As you can see, and by all means to my surprise, by 1966 the Illorsuit hunters (or, at least these two men) had switched to this different style of shooting screen — larger than in 1959 and positioned immediately in front of the harpoon line tray. And, I had no idea for how long the 1959 style had been in use. For none of the earlier kayaks for which I have photos and/or information is there anything to tell us what style shooting screens were used with those kayaks. Recently, however, I’ve seen Ernst Sorge’s “With ‘Plane, Boat and Camera in Greenland.” [I am much indebted to Vernon Doucette for very kindly gifting me a copy of this book.] 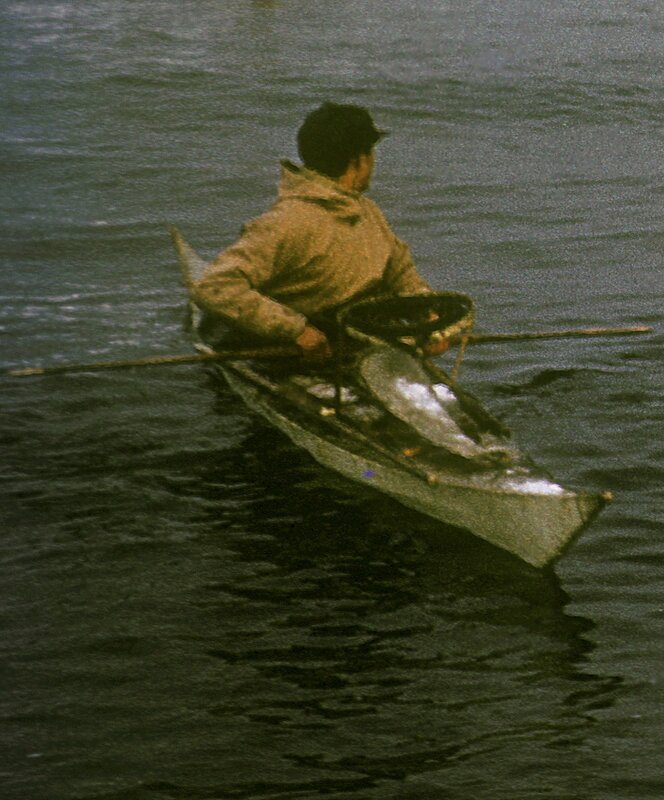 In the group of photos that follow page 80 there are two photos of a kayak equipped for hunting, and the shooting screen is exactly the same style as in 1959. Sorge was in the area (with the “S.O.S. Iceberg” film making crew) in 1932. When I was there all of the hunters were equipped with the typical two-thumbed sealskin mittens. Tobias holding up a seal he just caught for me to get a good look at it. He’s wearing his mittens but unfortunately you can only see one of the two thumbs. In fact the two drawings by Rockwell Kent that I have at the beginning of Chapter One, “Life in Illorsuit” show them better than any of my photos. What it’s all about is that the hunter begins the day wearing the mittens one way, then when the sealskin they are made of begins to get waterlogged on one side he’ll turn them over, use the other thumb sheath, and have the dry sides on the insides of his hands. 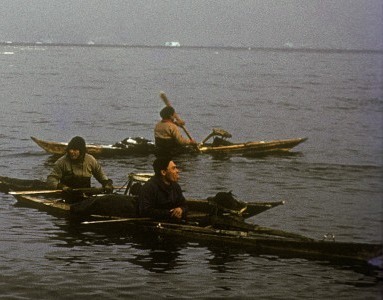 In 1959 when all the kayak hunting was done using guns, no-one any longer wore the full-jacket. In fact, hardly anyone even seemed to have a full-jacket. The kayak rolling at Illorsuit was all done using my brand new tuilik. At Uummannatsiaq village where young Johannes prepared himself to demonstrate some kayak rolling, it seemed there was just one tuilik — and it had a hole in the hood which had to be quickly repaired. Hansen mentions that in the village where he did his research only one hunter “Bendt Frederiksen owns a garment of this type, made by his mother Laurette” (2008, page 138). Also, I’d been puzzled by photos, and even an old drawing, of “full” jackets that came down only to the kayaker’s hips. Surely, I thought, these would not be long enough to allow for any necessary kayak rolling? A well-known photo [AI #18977] showing that short length “full jacket,” taken by John Møller at Nuuk in 1910. 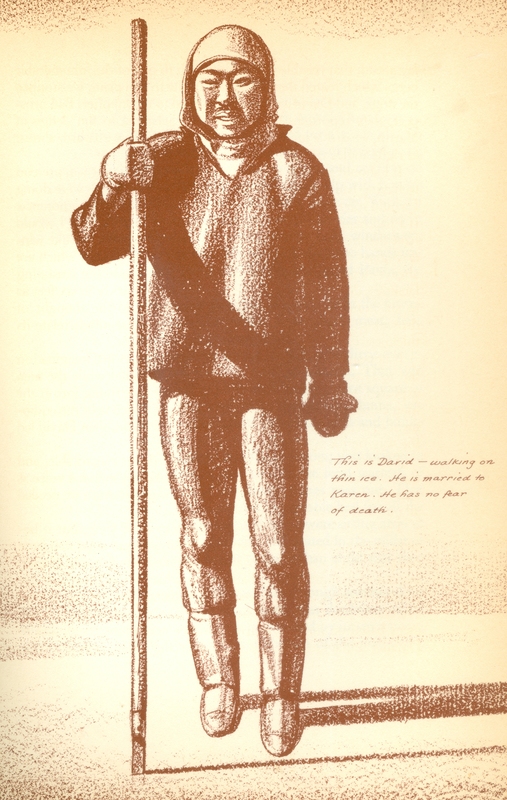 Because Petersen tells how: “In more recent times the kayak suit reached only to the hunter’s hips, but formerly it went down almost to his knees. … this seems to have been a matter of fashion — an unfortunate fashion, as it has cost any number of hunters their lives.” He then quotes a story of a capsize told him by a friend which ends with “… I certainly would have drowned if I had been wearing the short, modern type of suit” (1986, pages 112 and 114). I’m happy to be able to say that I never saw or even heard of any of these short tuilik in 1959. 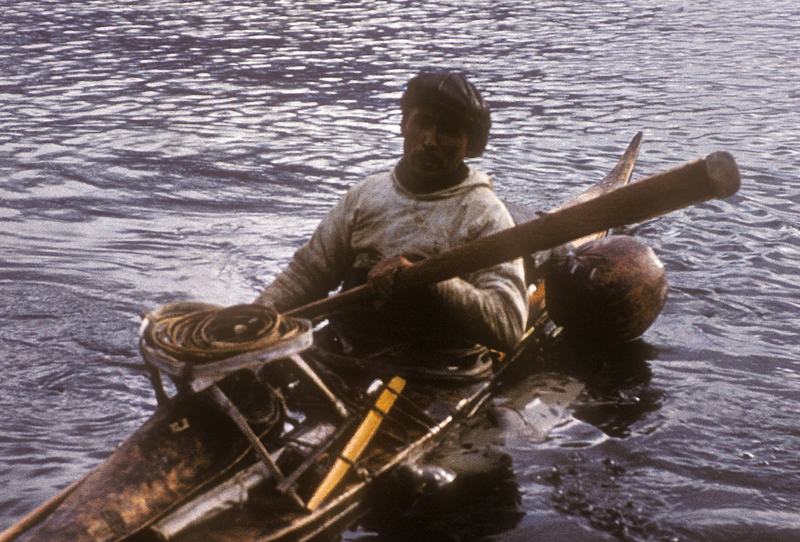 What everyone did wear when kayaking was the tuitoq as in this photo of Enoch carrying his kayak to the water. You can see that it’s little more than a cylinder of seal skin, though narrower at the top. Of course, it was made to fit as tightly as possible onto the coaming ring. 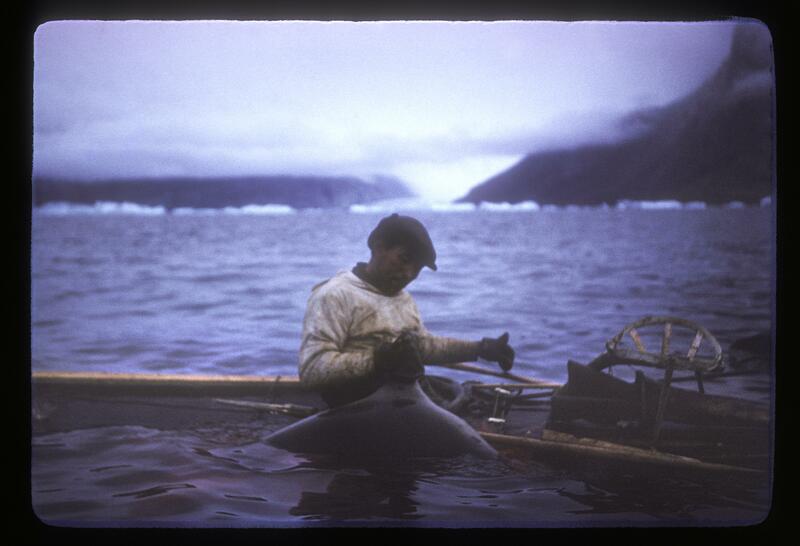 Many photos of the old days show hunters with suspenders for their tuitoq but I didn’t see any in 1959. And a closer shot of Enoch’s almost worn out sealskin trousers and and his sealskin boots, typically what the men wore when kayak hunting. He’s being his usual entertaining self — clowning with a piece of seal intestine. And, a few weeks later, Enoch with his wife Regina and their two children. And now he’s wearing a brand new pair of sealskin pants. As Enoch has in the two photos just above, and Tobias also in my many photos of him in his kayak in my Chapter Eight, The Hunting Trip … , most of the hunters had a white anorak made of very thin material which they wore over their other clothes for camouflage while stalking the seal. You can see that Enoch also has something white on his hat. It’s actually one of my handkerchiefs. Three designs for the wings on that kind of harpoon (Petersen 1986, page 79). I see Enoch’s as being quite similar to type C, but without the decorative hearts and diamond. Enoch squeezing into his kayak at the Karrats campsite. Another view of his winged harpoon where you can see the two wings separately. 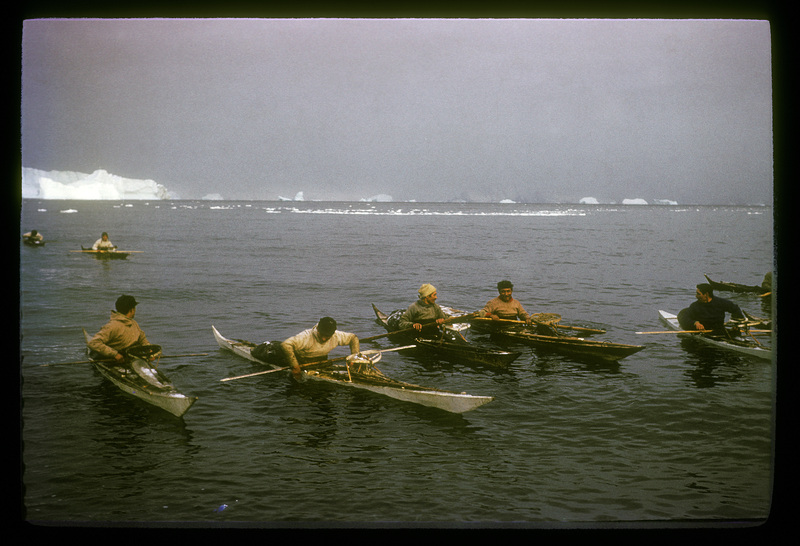 Everyone else in Illorsuit had the knob (unaq) style of harpoon like the one on the kayak Karl Ottosen is using (that’s him in the pink sweater). He has the harpoon pushed well forward of its usual position on account of the race they had just finished. You can actually see the “knob” way forward practically at the tip of the bow of the kayak. Hansen (2008) speaks of one young hunter he knew who used a winged harpoon. The other hunters he knew in the Upernavik district all used a modified version of the knob style of harpoon. Which of the two was considered more effective I don’t believe has ever been decided. Hansen was told: “Some hunters maintain that the wings make the harpoon more stable in flight both in the air and in the water, whereas others believe that they are only of significance when the whole harpoon shaft is under the surface of the sea. The knob harpoon has certainly a tendency to lose direction in the water whereas the winged harpoon appears to continue along its trajectory” (page 113). And Petersen says, “According to an old hunter: ‘When you have used a knob harpoon and switch to a winged harpoon your harpoon feels like it has become better oiled and is more willing to fly'” (1986, page 79). And then, when we got back to Illorsuit from Umiamako trip, I discovered that Jacob Zeeb, Johan’s nephew, was making himself a winged style harpoon – just like Enoch’s! The harpoons as I saw them in 1959 did not have the two hanging straps attached to the actual shaft of the harpoon that Petersen describes as having been traditional (1986, page 76). Actually you can see how having these two straps allowed the harpoon to hang over the side of the kayak in the 1910 photo showing the short “full jacket,” above. 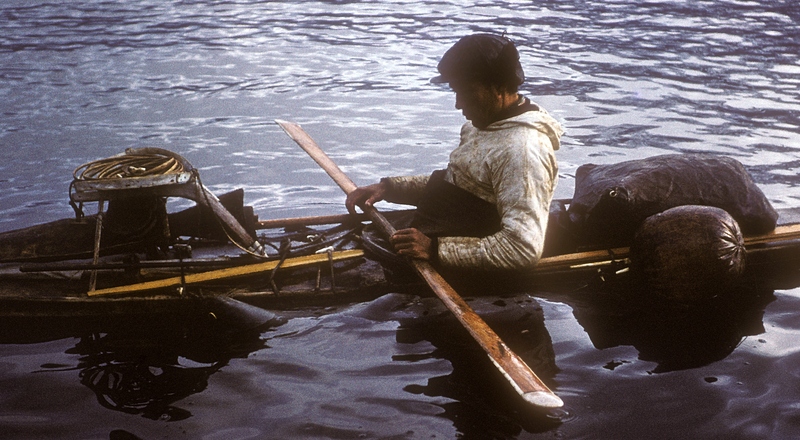 Scavenius Jensen says of these straps: “they are used in the winter to have the harpoon hang in the water along the side of the kayak so that the harpoon will not ice up on the deck” (1982, page 34). What the harpoons I saw in 1959 did have was one short thong with a bone button on its end attached to the throwing stick. This allowed them to dangle their harpoons in the water for its coldness to tighten up the thongs of the harpoon foreshaft, while and only while they were settling themselves in place and making sure that all their hunting gear was ready for use. Since I was able to accompany the hunters in my Scottish kayak, I was there to see where the harpoons were placed when they began to hunt. Pretty much as soon as they set off they lifted their harpoons out of the water and onto the side deck where they were kept in place by the hook at the bottom of one leg of the line tray and the ivory tab set on the bulge of the “masik.” This, of course, was what I saw in late September — before it was cold enough for there to be any risk of the harpoon icing up on the deck. 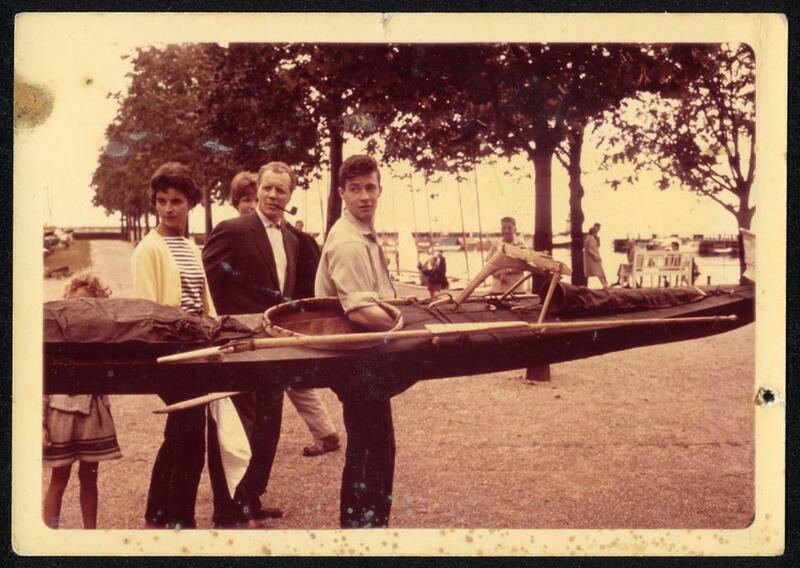 This photo of me carrying “my” kayak, at Hellerup Harbor, Copenhagen (in 1960), shows more clearly how the harpoon is held in place by the hook at the bottom of the right hand leg of the line tray and the tab on the end of the masik. A winged harpoon is supported in the same way (see photo above of Enoch’s winged harpoon in place on the side deck of his kayak). Another shot of a knob harpoon in place on the side deck. In both these photos you can also see how the throwing stick is clipped onto the harpoon just behind its point of balance. Tobias posing as if about to throw the harpoon, gripping the throwing stick. In fact, his hunting float no longer being on the after deck of his kayak, let’s you know that he’d already harpooned a seal before I asked him to pose for this photo. Me throwing the harpoon at Loch Lomond. Showing the leverage provided by the throwing stick. Interesting that the shaft of the harpoon is bent by the force of the throw. A good chance, by the way, to compare the looks of the two kayaks — Tobias’ and the one made for me. Again this close up which allows you to see how the end of his throwing stick hooks into place between the two wings of the harpoon. Everyone else in Illorsuit used a knob harpoon with the norsaq clipped onto pegs placed just behind the point of balance of the harpoon. It’s the rear peg that the norsaq pushes on to send the harpoon on its way. That peg is set at an angle, sloping backwards. The forward peg sits at right angles to the shaft of the harpoon. When the throwing stick is hooked onto the rear peg and then firmly clipped onto the forward peg it’s held securely in place. This photo of the norsaq made by Johan Zeeb for John Heath, was posted some time ago on QajaqUSA.org by Greg Stamer. A close up of the rear end which engaged with the rear peg and propelled the harpoon on its way. Here’s a photo (from 2012) of the norsaq Johan made for “my” kayak, to show how it had the short thong with button I described just above. The Goodnow kayak, from 1896, had a norsaq with it. While it has also broken off, apparently it had exactly the same short thong with button as the 1959 examples. All of the hunters kept their harpoon lines carefully coiled on their harpoon line trays, with the harpoon head at the “front” end of the coil and a connecting strap to the hunting float at the other. The lines were all of seal skin, Bearded Seal skin, cut in a long spiral from the cylinders of skin cut from the seal for this among other purposes. Once the desired length had been cut in this way it was carefully softened and trimmed, leaving it with some slight stiffness which would help it coil easily and regularly. Here’s Tobias, one seal already hunted, caught, and being towed back to camp, with his harpoon line neatly coiled back in place on his harpoon line tray. Most hunters, but of course this depended on their individual skill, used harpoon lines that were 30 to 40 feet long. They may have been longer in the old days, before the use of firearms made it possible to be closer to the seal before throwing the harpoon. Since long before 1959, the blades of the harpoon heads were all being made of metal. 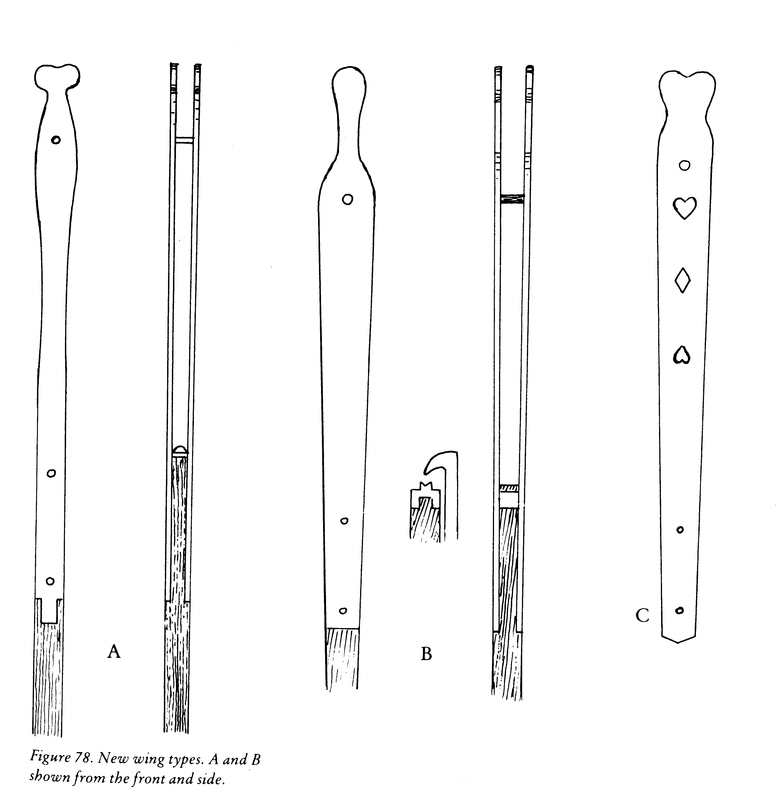 The bone or ivory body of the harpoon head was still carefully shaped in one or other of the many traditional ways so as to “toggle” sideways under the seal’s skin. 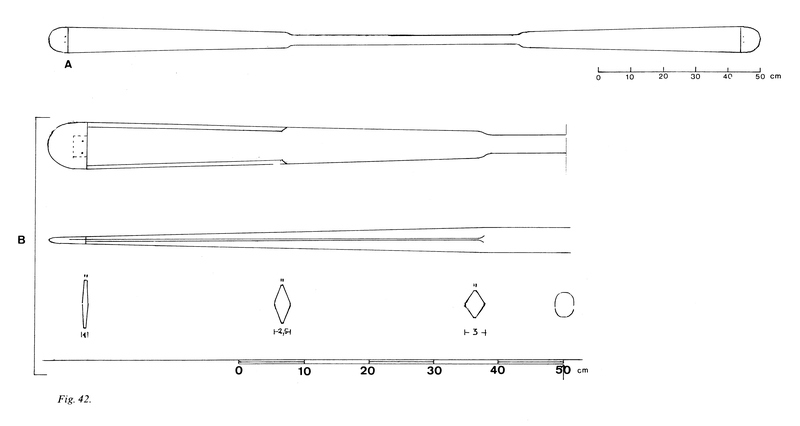 Petersen (1986) shows with drawings and photos an astonishing number of variations in harpoon head design: 18 in all. None of the harpoon heads I saw had the barbs carved in the sides of the body that were known in other times and places on the west coast. Like all harpoon heads, of course, they were designed to stay in place once the seal’s skin had been penetrated and to toggle sideways to ensure that the harpoon line with the float at its far end was securely attached to the seal. Both functions were taken care of by means of a double tail with a certain amount of outwards, curved flare. Figure 86 on page 83 of Petersen (1986). Harpoon heads from West Greenland. A portion of figure 87 on page 84 of Petersen (1986). The specimen labeled “E” in the drawing above shows the kind of harpoon head with side barbs that I never saw during my visit. Specimens “G” and “H” are close to the ones I did see and, in fact, the one photographed (twice) in fig. 87 is almost exactly like the ones I saw in use. 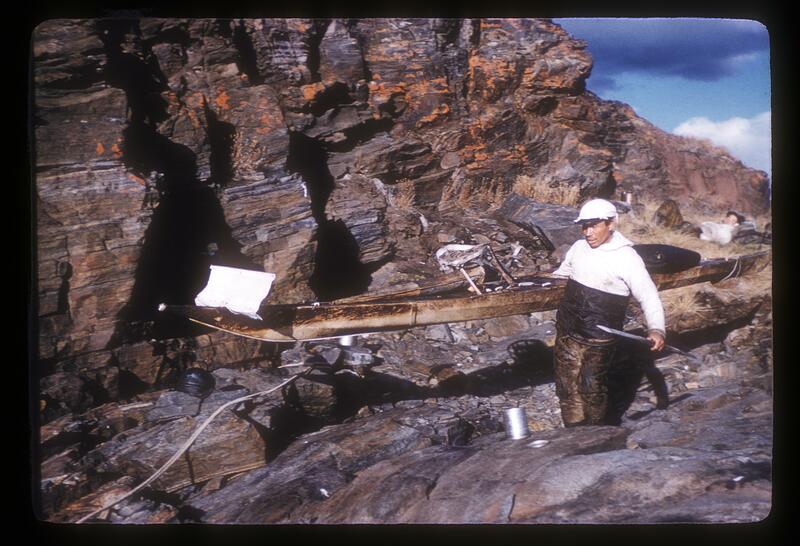 Petersen explicitly says that this type was used in the Uummannaq area. As you can see in this photo of Tobias removing his harpoon head from a seal, they were actually quite small. Several times I was shown how you could hide one from view in your closed fist. Here I’ve zoomed in to show the harpoon head (that’s it, hanging from the loop at the end of its line, below Tobias’ left hand). The inflated and highly buoyant hunting float was needed for two reasons. Once it was firmly attached to the seal it would be virtually impossible for the animal to dive deep and escape. Also, in the case of a seal thin enough to sink when dead, that too would be impossible on account of the float’s buoyancy. The very first seal I saw successfully hunted, at the beginning of our hunting trip to Umiamako (see Chapter Eight), was like that and when Enoch handed me his harpoon line with the seal still on the end of it I had to pull it up from quite a depth. Wherever I saw kayaks they all had the same kind of avataq, made of the entire skin of a small seal with its black outer epidermis intact, and not shaped in any way. Farther south on the west coast the hunting floats had a more or less standard curved shape. There was a special device used to shape the floats in this way. This is a photo Golden has on page 48 of his KoG. 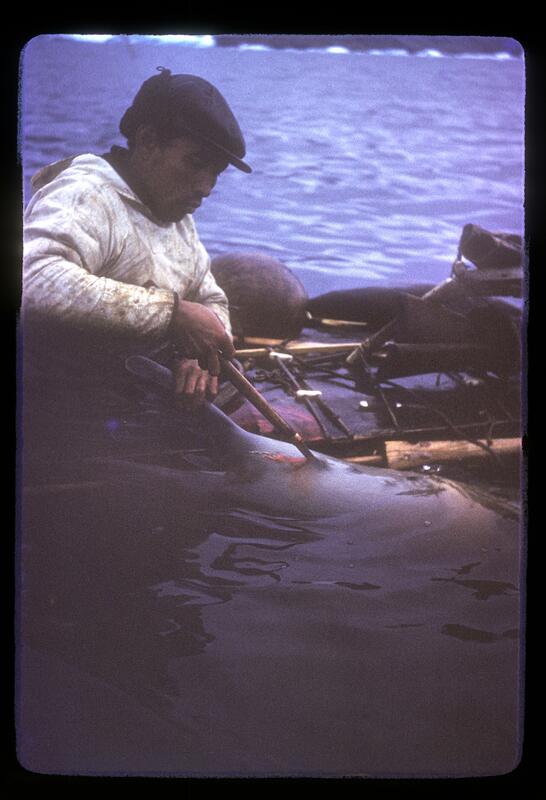 It shows a hunter in Nuuk, in 1910, with a huge seal he’s just caught. His kayak’s a beauty and has that kind of curved avataq. In the Uummannaq Bay area and also in the Upernavik area (see for example the photographs on pages 104 and 118 of Hansen 2008), the hunting floats were not given this shape. In the photo below, some of the Illorsuit ones are good examples of this, especially the ones on the two white kayaks (Ludwig’s and Hendrik’s) and the one on the kayak in the foreground (Hansi’s). The floats were held in place immediately behind the hunter by two lengths of bone which were tucked under the one or two after deck thongs. So that’s what it was all about – getting your hunting float securely attached to the seal you’re hunting, so that it cannot escape and won’t sink when it’s dead. The thrust of the harpoon delivers the harpoon head into the body of the seal. But what happens then? The harpoon head needs to separate from the harpoon itself and be left in the body of the seal and that’s when you begin to see how ingenious the whole thing really is. So that’s how it works and the hunters all seemed to be extremely accurate with their harpoons. Drever tells of how in 1957 he pulled a target in front of a group of the men with his outboard motor boat, at “full throttle,” and when he stopped all eight harpoons were firmly in the target. For what it’s worth I never did see or hear of anyone missing a seal and having to pull his harpoon etc. back in to rearrange it all and try again. 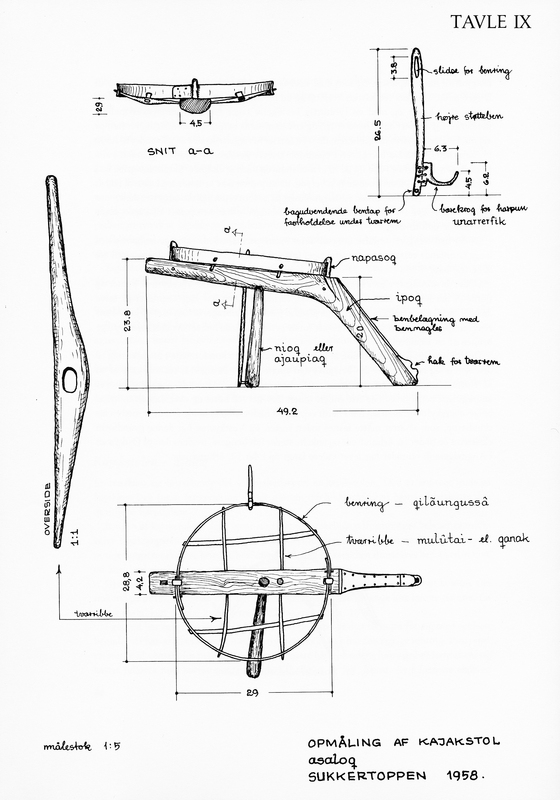 This is Scavenius Jensen’s 1958 measured drawing of a harpoon line tray from Sukkertoppen (now Maanitsoq) – very much a flat line tray (Jensen 1975, Plate IX). In this photo Hendrik’s (he’s leaning forward in the white kayak) has the “butterfly” shape, so does Hansi’s (behind him). Karl Ottosen in the pink sweater is in Malaki’s kayak which looks to have a flat line tray. Here, in the middle, Ludwig’s tray is flat. From this and other photos of the Nuugaatsiaq hunters’ kayaks at the Umiamako camp I can make out five flat and two butterfly-shaped line trays. Uummannaq town kayaks three of them with butterfly-shaped line trays. 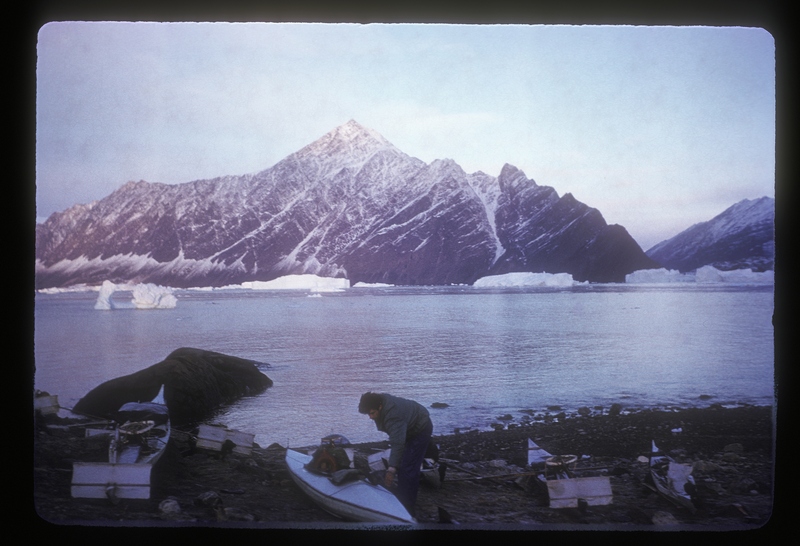 The “Sunday hunter” at Uummannaq entering his canvas covered kayak. His line tray has the flat shape. Here is an exaggeratedly butterfly-shaped line tray – at Uummannatsiaq, near Ikerasak, which (as I tell about in Chapter Three) Bent Jensen and I visited before I made it to Illorsuit. In Keld Hansen’s Nuussuarmiut (2008) he shows two variants of the harpoon line trays as used in the Upernavik district, in 1967-68 (see below). Both have flat line trays. Was this then an Uummannaq Bay innovation? Does anyone know of such “butterfly” shaped line trays being used anywhere else? Back to the Ummannatsiaq specimen – not only is this a butterfly-shaped line tray, it also appears to have an extra leg or something on its left hand side. Maybe it’s a “brace” between the rim of the line tray and the diagonal leg? By checking all of my photos that might show this feature, I reckon that Hansi’s line tray also has this “extra” piece; one other Illorsuit hunter’s tray has it; two of the Nuugaatsiaq kayaks also have this feature; and one of the Uummannaq town kayaks does. When I looked again at Hansen’s Plate 10, I saw that both variants have this kind of a brace from the rim of the tray to the diagonal leg. Also, both show a brace from the center piece to the vertical leg! The relevant section of Plate 10 of Hansen’s Nuussuarmiut, shown here with his kind permission. All the hunters carried the gear needed to tow one or more seal back to village or camp. 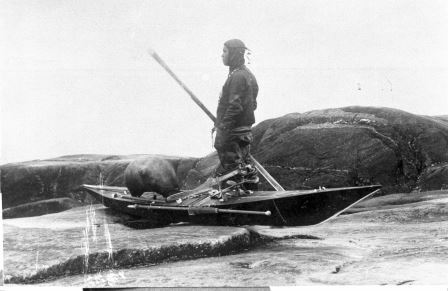 A dead seal (unless small enough to be carried on the after deck) was generally towed on the left side of the kayak, though the few hunters who used the left arm to throw their harpoons would presumably tow their seal on the right side. The seal were always towed “belly up” and head first, securely fastened by towing straps to the side of the kayak. 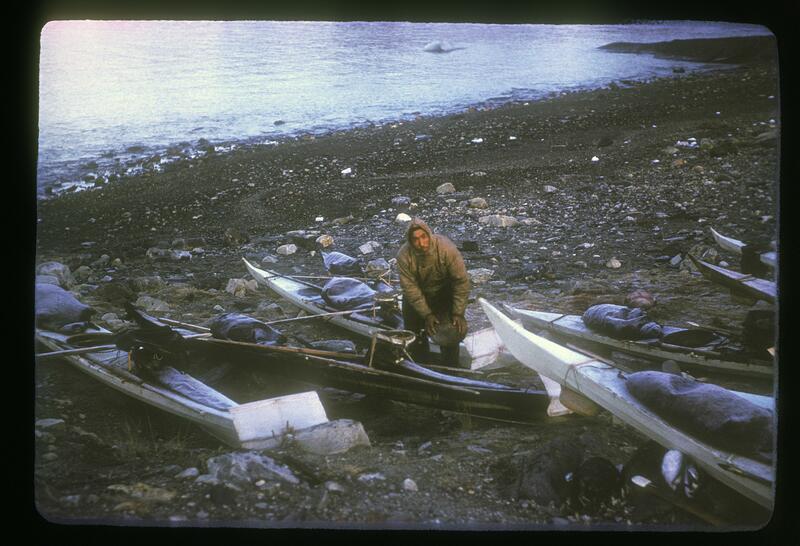 These straps, made of seal skin thong, were usually kept inside the kayak until needed. 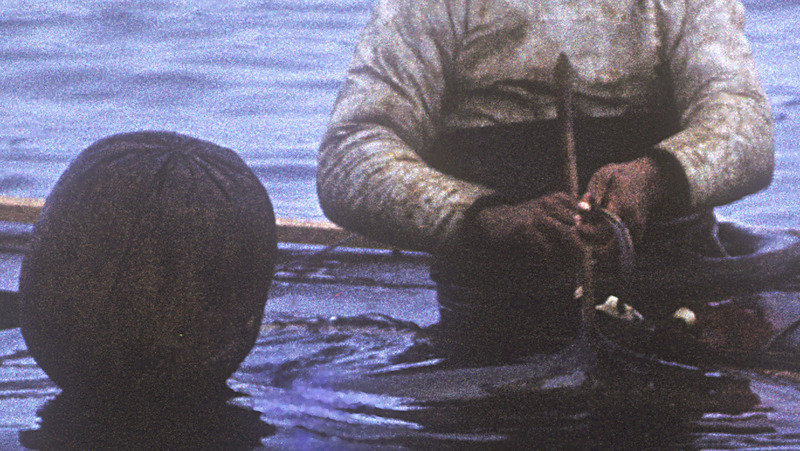 The seal’s head was held close against the kayak by a strap with a toggle of bone at one end which was inserted through a cut in the seal’s chin and an ivory button some 10 to 12 inches along the strap which was tucked under a fore deck thong (typically the fourth in front of the coaming). At the end of the strap there might be a lateral bone (or wood) handle and a firm pull on this would release the front of the seal from the kayak. But the chin towing strap my kayak was equipped with had a simple loop rather than a bone (or wood) handle (see Chapter Eleven, “Re-encounters with the Kayak”). From the photos here it looks like Tobias’ chin towing strap also ended in a loop. I see no sign of any bone or wood handle in these photos. A second thong or strap was similarly attached to the seal’s belly close to its navel. 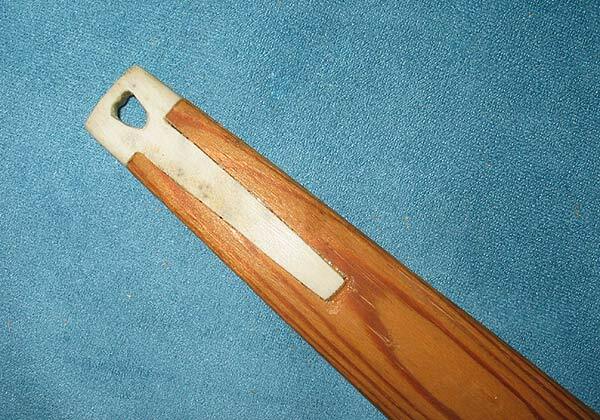 This had a seven or eight inch long ivory pin which was slipped under the after deck thong(s), pointing forwards. Once the head of the seal was released, the drag of the seal’s body would pull this pin free. This second strap had a small flotation bladder attached to it which would help the hunter find the seal when ready to do so and keep the seal floating if it were thin enough to sink. When a hunter caught two (or more) seal, the second would be attached by another strap to the first, and so on. In that way, if a hunter needed to free himself of the seal he was towing for whatever reason, that one firm pull on the front strap would release it/them. As I mention in the chapter “The Hunting Trip to Umiamako,” Edvard once caught two seal when hunting from that camp and, that same day, so did one of the Nuugaatsiaq hunters. Several photos in that same chapter show Tobias preparing a seal for towing back to camp using these towing straps and flotation bladder. Fabricius, Birket-Smith, and Petersen (1986, pages 105 to 107) all show drawings and/or photographs of these straps as being linked together on one fairly long length of thong. This had me puzzled for a while as I was sure I remembered Tobias using two separate straps – one for the head attachment and one for the hind quarters. Checking in Hansen’s Nussuarmiut I found that in the Upernavik district they also used two separate straps. 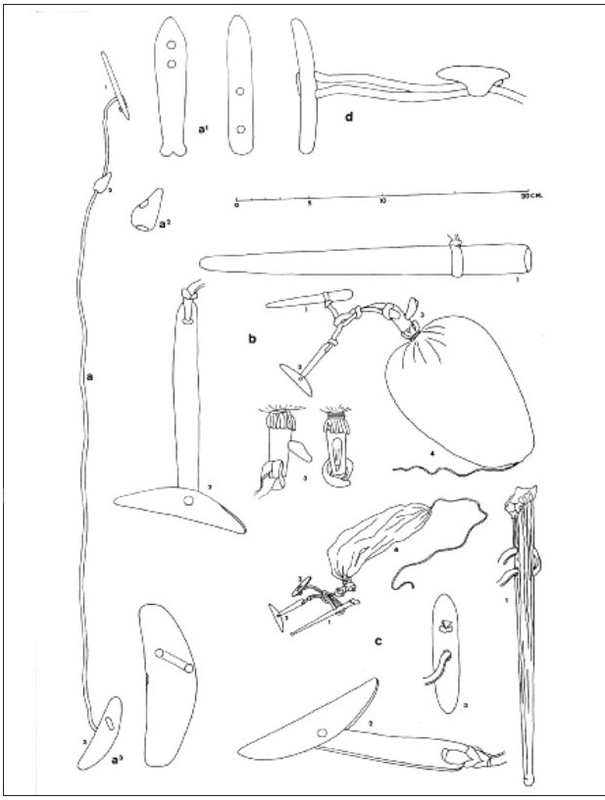 What this shows is the head strap, which he calls the towing line (orsiut) on the left, with a1, a2, and a3 being enlarged drawings of its three parts; the b and c drawings show the navel strap and flotation bladder also with their various parts repeated in enlarged drawings; item d on the upper right he calls an adjustable drag line (also orsiut). It must the additional strap that would be used to attach a second seal to the first, etc. Zoomed in on Tobias towing a seal to get a better look at the way he’s using his towing gear. You can see the ivory button tucked under the fourth fore deck thong with the strap coming from it crossing the yellow spar of wood and then bunched up in front of him. That’s what he’ll pull on if he wants/needs to release the seal. Behind his elbow that’s the flotation bladder attached to the navel strap with that strap’s seven inch long pin tucked under one of the after deck thongs. The head strap and the navel strap are not connected to each other. This arrangement is virtually identical to what Hansen shows in his plate 14. So this kind of towing gear was used in both the Upernavik district and Uummannaq Bay. Tobias’ kayak knife had a long handle of wood, just over two feet long, and a blade the size of that of a Swiss army knife. As you can see in one of the photos in the Hunting Trip chapter, he even used this knife to cut off chunks of (cooked) seal meat already gripped with his teeth. He used it to kill the seal he caught by harpoon alone (the first one I saw him catch), and in preparing that and other seal for towing back to camp. Here he is making the incision to fasten the rear or navel towing strap to a seal. Interesting that he has another knife, what looks like a regular pocket knife, under the third thong on his fore deck. I left Illorsuit before the first sea ice of the winter appeared, so it was not yet cold enough for the ice scraper to be in use while I was there. In all the villages I visited and again in Illorsuit, there seemed to be kayaks everywhere, at least in front of all the houses. They were kept on racks (qainivit) some individual, some communal, high enough to be out of reach of the ever-hungry dogs who if given the chance would eagerly eat much of the hunting gear not to mention the very (seal) skins of the kayaks. The kayaks actually in use during those days were kept upright with all their hunting gear in place, with a cover of some sort over the manhole. Here, if you can make them out amidst all the snow, are three of the Illorsuit kayaks on their racks. The center one shows the classic single kayak rack design of a horizontal spar at one end and a “vee” shaped support at the other. When the gale of September 12th became really fierce, early that morning, there was a general rush down to the qainivit to get them, the kayaks on them and the shark meat racks all roped down and anchored more securely. My Scottish kayak which was being kept on Sakeus’ fish rack was partly filled with rainwater! Ludwig helped me take it to safety in the dance hall. Sakeus’ own kayak lost its manhole cover which I saw being blown out to sea! Meantime I was also struggling to keep my tent from being blown down, holding up the ridge pole against the force of the wind, and needing help to re-peg some guy ropes that had come loose. Later on, with Peter’s help, I put in a totally unorthodox new pole to hold up the ridge at its center point. The kayaks and their qainivit all survived. But that was quite a day. The following day was a flat calm! With what looked like low, snow-laden clouds and the upper two thirds of Upernavik Island now covered with snow. Johan with his kayak (more than a month and several snowfalls later). He has that same kind of rack: a horizontal spar at one end and a “vee” shaped support at the other. One of the Qaarsut kayaks on a rack with a horizontal spar at both ends. Kayaks on a communal qainivik in Uummannaq town. Several things worth noticing … The closest kayak is a good example of how the sea ice in the early winter can gouge into the thickness of the sealskin. Interesting is the darker color of the fourth skin, closest to the stern. Possibly a repair was needed and was done by replacing just one of the four skins on the kayak. Also, of course, that this kayak is currently in use with most of its hunting gear attached. In my chapter on “The Hunting Trip to Umiamako,” I mention at one point that Tobias was right-handed (his harpoon was on the right side of his kayak). That was probably correct and confirmed by his preparing seals for towing always on the right side of his kayak, even though they would then be moved to the left side for towing back to camp or village. Golden in KoG, pages 88-89, talks of off-center cockpits on some old time kayaks and of right- and left-handedness, as does Petersen (1986, page 40). Whenever the condition of the kayak examined allowed, Golden shows on his scale drawings and/or tells in his text what was the position of the harpoon support. Of the 81 West Greenland kayaks, there is no information for ten. Of the 71, only two have the support on the left hand side. The other 69 all have it on the right. At Uummannatsiaq, in my photos you can see four right-handed kayaks. At Qaarsut, three right-handed kayaks. 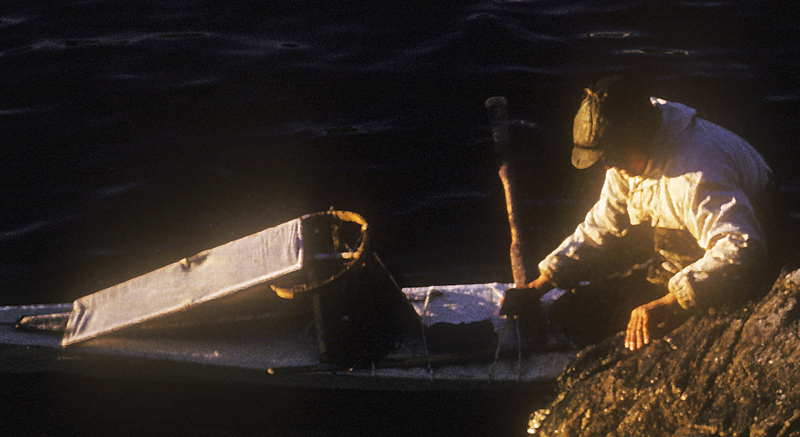 At Umiamako, my photos show that at least 10 of the 12 Nuugaatsiaq kayaks were right-handed. I can’t swear to this (because of all that data having gone missing) but I don’t remember that any hunter in Illorsuit had his harpoon on the left hand side of his kayak. Of the 18 kayaks at Illorsuit, three that I tried out, and another 11 where this can be seen in my photos, were right-handed. For one kayak in one photo I can’t make this out. And retired hunter Johan Zeeb’s kayak was also right-handed. Of course some of the Greenland Inuit must’ve been left-handed, but it seems that virtually all of them were trained to use the harpoon with their right arm. Nevertheless, if we take another look at the photo above we can see that one of the Uummannaq town kayaks on the large communal rack (of the three kayaks with line trays it’s the one farthest from the camera) has its fore deck equipment arranged for a left-handed hunter!